If you’re interested in heading out on a safari holiday, there’s a huge array of destinations and resorts that you can visit. One of our favourite locations is Hwange National Park, which is located in west Zimbabwe and the landscape is defined by lush grasslands and mopane woods that are home to huge elephant herds. With a plethora of Zimbabwe safaris on offer, below we’ll consider the most compelling reasons to visit Hwange and enjoy all that it has to offer. Aside from elephants and predatory lions, the Hwange National Park is also home to endangered species’ of wild African dogs. These wonderful animals, which once roamed through 39 countries and are commonly referred to as the Painted Dogs, have seen their numbers dwindle from 50,000 to just 3,000 in recent times. This considerable loss has been triggered by urbanisation and a loss of natural habitat, while conservationists have looked to counter this by creating the inspirational Painted Dog Project Centre. This incredible facility aims to address the issue of sustained population loss by taking direct action, namely by rehabilitating injured or orphaned dogs and providing long-term education to communities in the area. Visitors to the Hwange National Park can participate in various development projects during their stay, and we can think of no finer way to spend our holidays. 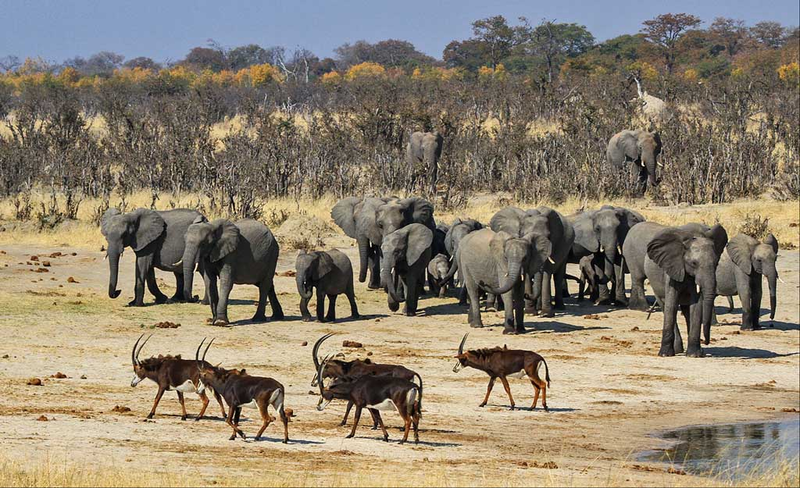 The region around the Hwange National Park has undergone significant and positive change in recent times, with steps having been taken to turn several local villages into thriving tourist destinations. This creates a fascinating educational and cultural experience for travellers, who can visit traditional homesteads to see how local people live and understand the heritage that underpins the region. The markets in these villages also offer locals the opportunity to sell their arts and crafts to visitors, creating a local economy that sustains communities and help regions to maintain their cultural identity. During your stay, you can fully immerse yourself in this culture and experience something truly unique; and whilst we’ve already touched on some of the most beautiful national parks you should visit in your lifetime, Hwange offers memories you will never forget. On a final note, it’s important to remember that the Hwange National Park offers an incredible opportunity to see so-called big game species, and this is arguably the primary reason for booking a safari in the first place. As a result, the location is home to some truly spectacular game drives, which are accessible between 6am and 6pm and enable travellers to cover much of the park’s 14.650 sq. kilometre expanse. As we’ve already touched on, the park is home to one of the world’s largest herds of elephants, while lions, leopards and giraffes also travel in high concentrations in the region. Bird watchers may also be interested to know that there are nearly 400 species of this animal in the Hwange National Park, making it a twitcher’s paradise that’s arguably unmatched in Africa.